Chemistry for Kids: Why is Milk White? Many of us probably learned about chemistry in high school from a textbook (and probably promptly forgot most of it). Isn’t it wonderful we now have popular chemistry books for kids, like Why Is Milk White? : & 200 Other Curious Chemistry Questions by Alexa Coelho and Simon Quellen Field? In this unique book, 11-year-old Alexa Coelho came up with the questions and then science writer Simon Field answered them. Amongst the questions and answers, Field also has instructions for some hands-on science investigations. The answers to some of the questions might surprise you. When Coelho asks, “Can you change lead into gold?” it turns out that it is possible by bombarding mercury with gamma rays, and the process occurs naturally in stars. Take that, alchemists! The big advantage of the question and answer format in Why is Milk White? is that readers can skim through and read only the questions that interest them, a plus for reluctant readers. Middle grade readers who are serious science fans, however, will want to read it cover to cover. For more, see Growing with Science. Copyright © 2014 Roberta Gibson at Growing with Science All Rights Reserved. Categories: STEM Friday round-up | Tags: Why Is Milk White? 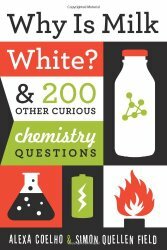 : & 200 Other Curious Chemistry Questions by Alexa Coelho and Simon Quellen Field | Permalink. Lifetime shows how many times a particular animal performs one behavior or grows one feature in a lifetime. I’ve been a sports fan all my life. That means I enjoy numbers and how they relate to performance. Growing up, I knew Babe Ruth hit 714 home runs in his career and cheered with my brother when Hank Aaron hit his 715th home run off Al Dowling. So when I read Lifetime, I was very interested in the numbers and what they could tell me. For example, you can make a lot of inferences with numbers. The first animal featured in this book, the cross spider, spins one egg sac in its lifetime. I think that must be one tough sac if it is going to be the only one that this spider produces. Inside that sac are 300 – 900 spiderlings. An alligator will build 22 nests and lay 550 eggs. I’m going to guess, based on the numbers, that less than 50 percent of the baby alligators survive. If more survived, we would be overrun with alligators. (I found an article at Discover Magazine that said only 10 percent end up growing to 4 feet, which makes them near invincible.) Several other animals, including woodpeckers, rattlesnakes, and dolphins, are featured in this book. The narrative text in Lifetime is sparse and an easy read for your average second grade reader. I love this because it isn’t so dense that young readers get bogged down. There are great opportunities for teaching sounds like /ir/ as in giraffe and birth. For advanced readers, the extensive back matter will satisfy their curiosity. Christopher Silas Neal’s mixed media illustrations are fun because he uses the numbers in the pictures. Giraffes have 200 spots so Neal illustrates two sides of a giraffe with 200 spots. Kids will love checking to see if Neal holds to form. Lifetime is a nonfiction book that will get worn quickly because it will be passed around several times between classmates. Check out more STEM reviews at NC Teacher Stuff. 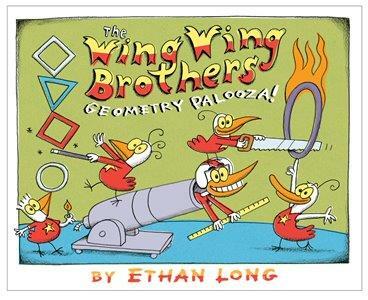 The Wing Wing Brothers Geometry Palooza! The Wing Wing Brothers are a family circus act of five wacky birds: Walter, Wendell, Willy, Wilmer, and Woody. They do their best to make math painless and fun. Using magic wands and feats of daring they whip those polygons into shape. What I like about this book: it’s silly and a fun way to play with math – as long as kids don’t try these stunts at home! Head over to Sally’s Bookshelf for some hands-on beyond-the-book activities. Copyright © 2014 Sue Heavenrich All Rights Reserved. Staring in amazement at the wonders it revealed. This is that coming of age tale of a young mouse. 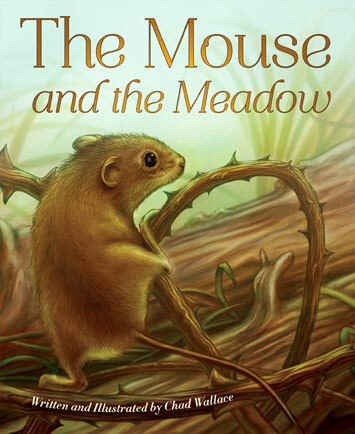 The illustrations give us a close-up view of life in the meadow. We meet a spider and honeybee, and watch a caterpillar metamorphose into a chrysalis. But all is not fun and games in the meadow; there are predators to avoid! I especially like the back matter where we learn more about whether – and how – animals talk, what altruism looks like in the animal world, and what meadows are. Head over to Archimedes Notebook for some hands-on meadow activities. help the seedlings in our garden grow. Copyright © 2014 Anastasia Suen All Rights Reserved. When reading Gravity, the first thing that struck me was the sparseness of the text. As Travis at 100 Scope Notes points out in his excellent review of this book, you just don’t see a lot of good nonfiction for the early primary grades. It’s a tough task to take a complex subject and break it down for our youngest students. There are only a few words on each page, but Jason Chin chooses the right words and has such rich illustrations that this is not a problem. He explains that this thing called gravity keeps objects from floating away from the Earth. Not only small objects like sand buckets and bananas, but also giant things like planets. Reading this book makes you want to say, “Phew, glad I have gravity!”. Of course, I could have used a little less of it when I was playing high school basketball, but let’s not go down that sad road. Chin goes on to explain that gravity not only keeps things from floating away, but within that same concept it keeps things together like the Earth near the Sun or the Moon near the Earth. In the back matter, you will find two excellent pages that go in depth with more details about gravity. You learn why some objects have greater gravity than others and find out about the terms mass, orbit, and weight. Jason Chin does fantastic work as evidenced by his previous books. He is certainly deserving of an author study in K-2. Students can explore how gravity affects objects as they impact the earth in a simple experiment using flour, a baking tray and a marble. Pour enough flour into the baking pan to create a layer one-inch deep. Spread newspaper under the pan of flour to make clean-up easier. Drop the marble onto the pan of flour. Carefully remove the marble from the pan and observe the crater in the flour. Drop the marble from different heights to test if the size of the crater will change. This experiment can also be done outside with rocks and a large area of mud. This experiment will allow students to better understand what happens when a meteor hits the earth. “Under the sea there is something gooey. It slips, slides, and sticks.” I love the way this book opens with alliteration – and the promise of something slimy and gross. 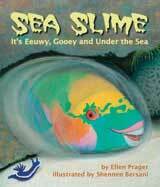 Lots of ocean animals, it turns out, use slime. It helps them go faster, find food, and avoid becoming someone else’s dinner. We expect sea slugs and snails to make slime. But clownfish? Each page highlights a creature that uses slime in some way. From jellyfish to slugs to squid, the text and illustrations underscore the diversity of life in the ocean. There are so many cool creatures that I’ve never heard of, like the vampire squid that shoots beads of glowing goo from the tips of its arms. At the back there’s more for curious kids: a page on “why slime”, a look at “lifestyles of the Wet and Slimy” and a recipe to make your own slime. For some hands-on slimy activities, head over to Archimedes Notebook.